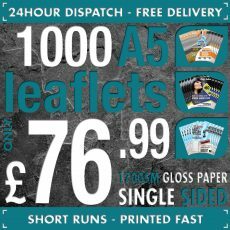 100 A6 105mm x 148mm flyers / leaflets printed double sided using the latest state of the art digital printing equipment to produce a product of exceptional quality with sharp vivid colours and a crisp clean look. We use high quality 250gsm silk paper which has a classy subtle gloss finish. Once you have made your purchase using the buy it now option we will send you your unique link for uploading your artwork, for the best result please supply your artwork at 300dpi in either a PDF, JPEG or TIFF format. Please note that additional charges may be incurred if artwork is sent in a non standard format.